There are many great perks of the Lawson Mini-Max Automatic Screen Printing Press. David Landesman, co-president of Lawson Screen and Digital Products highlights some important features of this semi-automatic printing press. If you are tired of pains in your wrists and back then the Lawson Mini-Max is the press for you. It is almost completely automatic, with the exception of spinning the speed carousel into place which locks automatically. 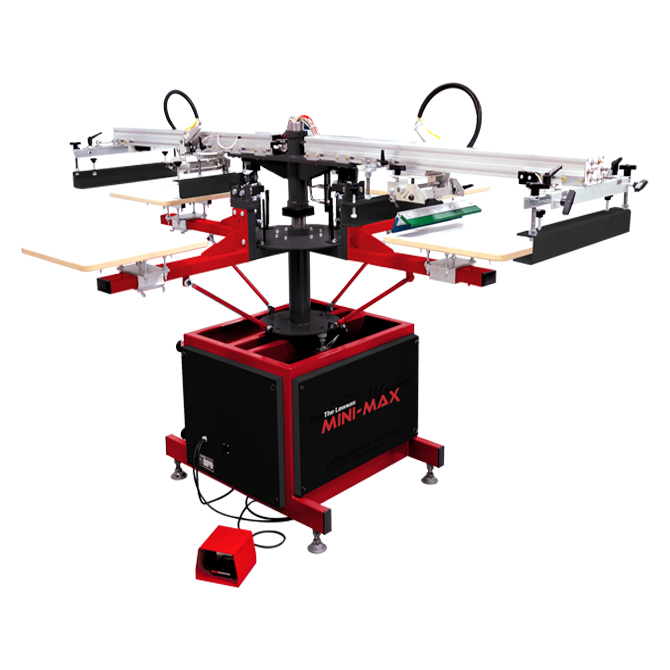 The Lawson Mini-Max Automatic Screen Printing Press is a space saver with being less than 8.5 feet in diameter. It will boost production because it prints while you load and unload garments. This silk screening machine has a consistent print and a two-color press costs under $10,000. There is none like it in the industry. If you want to quadruple production and save costs while putting less stress on your hands, back, and wrists then the Lawson Mini-Max Automatic Screen Printing Press is for you. To inquire more information please give us a call at 314-382-9300 or visit the Lawson Mini-Max webpage on our www.lawsonsp.com equipment website.